Meticulously crafted over a seven-year period, Loving Vincent is a visually wondrous biographical ode to the great impressionist and an animation like no other, comprised of 65,000 frames individually hand-painted by over one hundred artists. The sheer ambition and scope of this labour of love is an astonishing achievement. The screen shimmers as a living organism befitting and indeed resembling the work of its subject, a surface so rich that we can feel its undulating texture and multi-layered meanings. Witnessing changes in light, tone and emotion with all the colour, dynamism and expression of film stock we soon forget the medium and focus on the message. As though Loving Vincent’s aesthetic accomplishments are due ample praise, they should not overshadow an engaging narrative that is adroitly stitched together with the intrigue of a murder mystery or detective drama. Set a year after Van Gogh’s passing, family friend Armand Roulin (Douglas Booth) is tasked by his postmaster father (a wise, philosophical Chris O’Dowd) to deliver a letter written by Vincent to his brother Theo prior to his death. In Paris, upon learning from paint supplier Julien Tanguy (John Sessions) of the latter’s swift demise following the death of his brother, Armand continues to Auvers-sur-Oise where he investigates the how, the where and most importantly the why of circumstances surrounding Vincent’s supposed suicide by questioning villagers who knew him in the small commune where he was laid to rest. The squared aspect ratio chosen by the directors creates a canvas upon which further brush strokes, gossip, memories and opinion are added to painful recollections and a slowly focusing picture of the events, and people, involved in the tragedy. Even the great landscapes of Auvers-sur-Oise which offered such inspiration and solace to Vincent appear in portrait as this image takes form with a vibrant present giving way to sombre, muted blacks, whites and greys in flashbacks of testimony. Armand, who, like all great detectives smokes, drinks a little too much and is prone to throwing a punch or five, befriends the local innkeeper’s daughter (Eleanor Tomlinson), The Boatman (Aidan Turner), Van Gogh’s doctor Gachet (Jerome Flynn), his daughter (Saoirse Ronan) and their housekeeper (Helen McCrory) in an effort to learn the truth. The impressive assembled cast are not merely voicing their roles here as each resemble themselves in the fleshed-out pastels created by the enormous team of painters. And from one stepping stone of information to the next a clearer picture forms in Armand’s mind as to what really happened and, himself a young man searching for his path in life, the parallels between Vincent’s existence and his own leave a lasting impact on him. 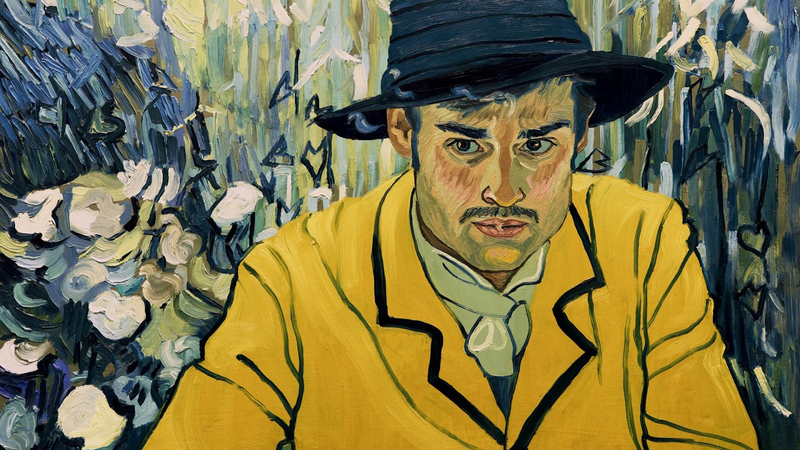 Loneliness, mental instability, judgement, prejudices and guilt all form part of the complex palette of revelations brought forward by Loving Vincent, a feature whose ultimate aim is to realign our focus not on the manner in which the posthumously famous artist died, but on the way in which he delighted in living.